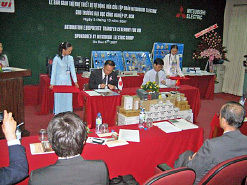 December 5, 2007, supported by Mitsubishi Electric Corporation Overseas Marketing Group, we held the presentation ceremony of Q-PLC series, (the Factory Automation products of Mitsubishi Electric CO., Ltd) at Ho Chi Minh University of Industry. This is the second ceremony following the presentation ceremony of FX series in 2004. Except the presidents of HUI, many people such as people concerned of technical universities and the media like television and newspaper participated in the ceremony. 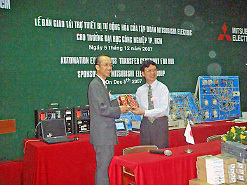 It was indicated that many Vietnamese Educational institutions have great interest in FA products. They establish the training course of Q-PLC at HUI, and continuously train experts with more improve contents than anterior seminar. Guangzhou, September15-18, 2007, in International Convention & Exhibition Center (China Pazhou), The 4th China International Small and Medium Enterprises Fair was held in this very year of the 35th anniversary of Japan-China diplomatic normalization. This fair is carried out for the Japan-China cooperation enterprise on the agreement of the two countries Prime Ministers. About 500 Japanese companies participateｄ in this fair, this fair became a largest class in the past, for the exhibition about Japanese company. Various type of industry: electronics, automobile, foods, travel, clothes, had a wide relationship each other. We supported Miyoshi Electronics Corporation to exhibit their thick film resister composite board in this fair. We are selling this product in China from now on. A thick film resistance composite board is mainly used for in-vehicle / power supply use. 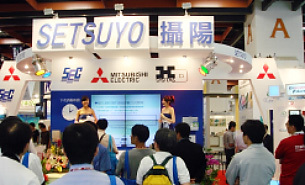 In Guangzhou in which a lot of auto industries gather from in and outside of China, it becomes a key how we appeal the technical capabilities of Miyoshi Electronics Corp.
Exhibiting Mitsubishi Electric FA Products in SemiTech Taipei (STT)2007. 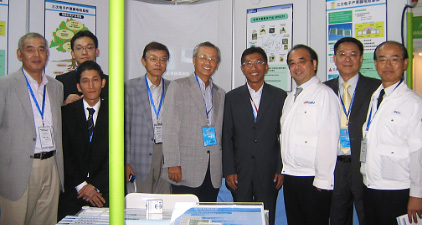 Taipei , May 10-12, 2007 , we exhibited Mitsubishi Electric FA products in Semi Tech Taipei, (a famous professional high-tech exhibition held in Taipei World Trade Center International Trade Building once a year). 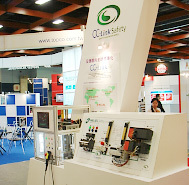 Semi Tech Taipei is jointed organized by Taiwan Semiconductor Industry Association (TSIA) and the Taipei Computer Association (TCA), about 150 of notable semi-conductor makers jointed in the exhibition and prepared over 350 booths. Especially this year, it is expected the construction rushes of establishment new factory for 12-inch wafers in Taiwan . We aim at sales expansion of Programmable Controller equipments for semi-conductor facility (for gas, electricity, water, air conditioner), so we strongly appealed Mitsubishi Redundant System of PLC and Inverter for control clean room. Many of visitors to our booth showed good response. In the CC-LINK Booth standing next to the SETSUYO booth, we introduced the Mitsubishi Electric Advanced Open field network, we hope much more wide spread of Japan open field network CC-LINK in Taiwan.